What kind of silver should I buy? Where is the best place to buy silver? Why should you buy silver? Silver is the second most consumed commodity, first is oil. Just read the post 101 uses of silver and you will see how versatile it is. What kind of silver should you buy? I remember my first silver buy back in 2008, it was a mix of Peace Dollars and Morgan Dollars, mostly with a GOOD or VERY GOOD grade. Of course, I over paid for these coins, they were advertised on some radio program. You would call in and they would push you to buy silver coins with numismatic value. Since then I’ve made all sorts of purchases of silver coins, bars, rounds, bullion, junk, even a handful of numismatics and paper silver! Yes, paper … I know that is an oxymoron. Before we dive into the different kinds of silver, let’s first get some basic terms defined out of the way. American Silver Eagle – (ASE) Official silver bullion coin of the US, 1986 – present. Austrian Silver Vienna Philharmonic – Silver bullion coin of Austria since 2008. Bullion – Gold or silver in the form of bars that is at least 99.5% pure. Bullion coins – Coins struck with at least 90% silver purposed for investment. Canadian Silver Maple Leaf – Silver bullion coin of Canada, from 1988 – present. Chinese Silver Panda – Silver bullion coin of the China, from 1983 – present. Coin Grading Service – Organization that grades numismatic coins. 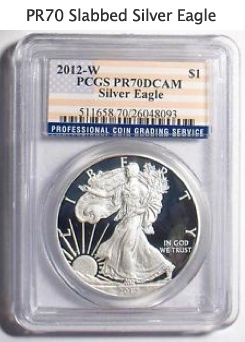 In coin collecting, PCGS & NGC are the top 2. COMEX – Commodity Futures Exchange in NYC, where silver is traded in contracts (paper). Face Value – The legal value stamped on the coin. Fiat Money – Paper money that is legal by law or government force like the US Dollar. Not backed by gold or silver. Fineness – The measurement of the purity of a precious metal in 1,000 parts. An American Silver Eagle is .999 Fineness while an 1885 Morgan Dollar is only .900 fineness or 90% silver and 10% copper. Gram – Metric system unit of weight where 31.103 grams = 1 Troy oz. Hallmark – Mark or series struck on precious metals to identify its purity or manufacturer. 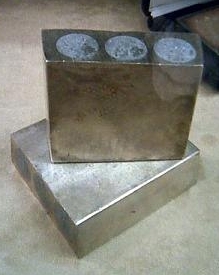 Ingot – When precious metal is cast into a shape usually a bar. Intrinsic Value – The true value of the metal content, as opposed to face value. Numismatic coins – Collectors coins whose prices trade at a premium because of their rarity, age, & condition. Premium – The amount that a coin sells for over its intrinsic value. 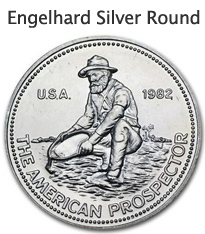 If an ASE sells for $25 while silver price is at $21, the premium is $4. Proof – Solely for collectors, these coins are minted with a mirror-like finish & sealed. Silver Rounds – Coins issued by private mints with .999 silver content. Spot Price – The price of silver traded over the exchange markets such as the COMEX. Bullion coins are fully backed by the host government and will always guarantee the weight and purity of the coins they produce. The most popular coin on the planet, the American Silver Eagle, comes straight from the US mint and is recognized worldwide as a silver bullion standard. 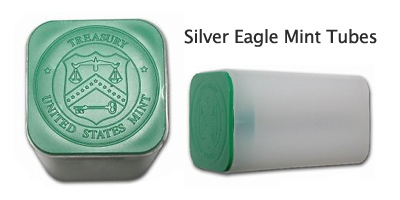 Minted bullion coins often come graded as Brilliant Uncirculated (BU) condition and are bought individually, in mint tubes (usually 10 or more) or in a big green monster box! Yes, it is called a monster box. These bad boys contain 500 coins which is equal to 500 ounces of silver. The come packaged in 25 mint tubes each holding 20 silver eagles each. Buying silver coins individually you will be paying the most for a single silver coin, as a lot of labor & skill go into the making the coin from mining the metal to striking. 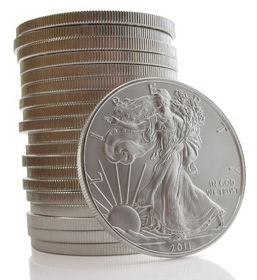 Premiums are usually between $3 – $5 for 1 silver eagle. The more you buy in bulk the lower the premiums come. 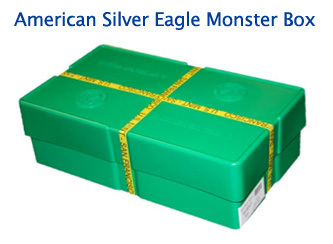 For example, on APMEX, buying 1 American Silver Eagle has a premium of $3.99. However if you buy a monster box of 500 coins, the premium drops to only $2.49 a coin. So you could possibly ‘save’ $750 by buying 500 coins as opposed to 1. Buying silver bars is one of the best ways to get silver. You will always get more bang for your buck when buying bars because the cost to make them is much cheaper than silver coins. The bigger bar you get the lower the premium over spot. 1 oz silver bars, are a great way to get started with your silver stacking. Cheaper than silver coins, you can buy them for a reasonable amount over spot. 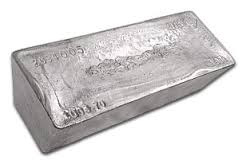 10 oz silver bars are another great entry product for the beginner silver investor. These are my absolute favorite silver bullion product as they are fun to hold and stack. You will definitely want to grab 1-2 to have in your collection! 100 oz silver bars are probably the most common form of silver bar on the market. Possibly a bit too pricey for a small-time investor, they can be a bit bulky. These are the best form of silver to buy if you are looking to increase your ounces. 1,000 oz silver bars. The granddaddy of silver bars! At 1,000 ounces they weigh a shocking 68.5 pounds. However, most of these bars are not exactly 1,000 ounces. If you are looking to buy cheap silver, this is it. Often times you can get them for just $.49 over spot! Not recommended if you have a bad back! 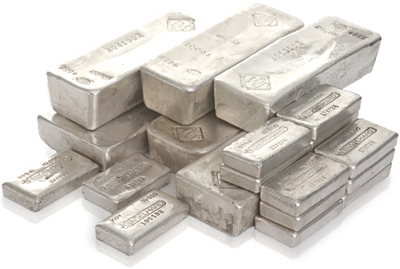 The most popular silver bars come from names such as Engelhard, Johnson Matthey, Sunshine Mint, OPM Metals, and Geiger. If you like coins but don’t want to pay the high premiums for bullion, generic rounds are a way to buy cheap silver. These are also a neat way to pick some cool looking coins if you are into design or art. Silver rounds are also popular for commemorate coins and are widely used as gifts. For this reason coin collectors will also gravitate to buying silver rounds because of their uniqueness and wide variety. If you just want silver for silver, just stick to the more popular ones and you should be OK when you want to sell them back or trade. Junk silver refers to US coins minted on 1964 or before that have no numismatic value above the silver content. 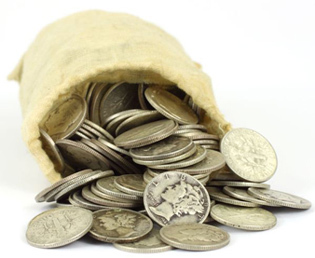 Despite its name, junk silver can actually be a really great investment, that’s because there is very little premium on the coins since they have no numismatic value and are mostly in fair condition. Junk silver is one of the best ways to buy cheap silver coins that have been minted by the US government. These coins will also always be legal tender no matter what happens to the price of silver, and are more recognizable than generic silver rounds from private mints. Almost all junk silver is 90% silver, with the exception of Kennedy half-dollars (40%) and Jefferson wartime nickels (35%). This type of silver is often bought from dealers in bags with Face-Value of $1,000, $500, $100, and $50. Of course, you can always buy them individually as well. $1,000 face-value of 90% junk silver weighs approximately 55 pounds and is equal to 715 ounces of silver. If you bought a bag of mercury dimes with a face value of $1,000, you would be buying 715 ounces of silver in the form of 90% mercury dimes. $500 face-value of 90% junk silver weighs about 27 pounds and contains 357.5 ounces of silver. Now, keep in mind that this bag will not cost you $500 but (price of silver x 357.5 oz), which with a sample price of $20 an ounce will run you $7150! $100 face-value of 90% junk silver weighs about 5.5 pounds and contains 71.5 ounces of silver. This bag will set you back $1430 if you assume a silver spot price of $20 an ounce. $50 face-value of 90% junk silver weighs about 2.7 pounds and contains 35.75 ounces of silver. This is a great way to get your feet wet with this kind of silver. At $20 an ounce this will cost you $715. Are you a stacker or a collector? If you’re not interested in the number of ounces you own you are most likely a collector or possible numismatist. Numismatics is the proper term for coin collecting. Investor beware! These coins have sky-high premiums and you are paying more for their rarity, age, or condition than the actual silver content. Having grades such as MS 70, these coins can easily sell for 10 even 100’s of times the silver value of the coin. There are countless stories of individuals who got duped into buying these ‘investment coins’ only to find out later their true worth. Late night infomercials and radio advertisements are often used to lure people in. Once on the phone, high-pressure sales tactics will be used to steer people to buy. While numismatic coins are a poor investment for the average silver stacker, they are a fun & interesting life-long hobby for others. The numismatic world has its own experts, grading services, coin shows, and even live bidding auctions. Take a look at some of the coins on sell at Heritage Auction. Just like fine art, if you don’t have experience and knowledge in this industry it’s best you stay away. You don’t want to be the ‘silver investor’ who paid $500 for just 1 silver oz coin. 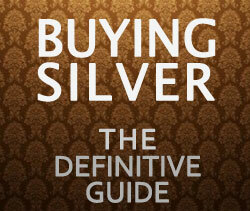 Our buying silver guide wouldn’t be complete without including “paper silver”. By paper silver we are referring to any silver that is not real or physical such as pooled accounts, silver ETFs, stocks, or futures contracts. Don’t be deceived if you think you own silver if it is just on paper. As a silver investor you never want to hear these words: Sorry delivery is not possible. Caveat Emptor: There is an old saying, If you don’t hold it you don’t own it. So always take delivery of the physical metal. While paper silver is not a scam, beginner investors need to be aware of the risk involved in holding silver certificates. We at silver coins strongly recommend you take physical delivery of your metal, in doing so you will guarantee you own the metal as well as help push the price of physical silver up! The most common form of paper silver is a pooled account, popular at large banks and investment firms. Your investment in silver will be ‘pooled’ with others, and like deposits at a bank, there is usually just enough physical silver in storage to cover expected withdrawals and not 100%. Other popular ways to invest are silver ETF’s traded on the exchanges which track the silver price such as iShares SLV or ProShares Ultra Silver AGQ. A word on private storage: Many private firms as well as reputable bullion dealers now offer private storage of precious metals in vaults for convenience and ease. While silver can be bulky, one of the most attractive things about buying silver is there is no counter-party risk. Allowing a private company to store your metal opens you up to such risk. These are just like any other business, mismanagement, fraud, lawsuits, greed etc, can always be a threat. If bankruptcy were to occur you will most likely never see your silver, so be responsible and take charge of your own wealth and money! Now that we’ve covered the different kinds of silver you to buy, let’s take a look at how to buy silver online or in person. Before you hand over any money, you will always want to be armed with the live spot price of silver to give you an idea how much premium you will be paying. 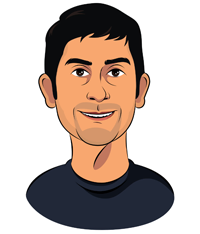 You can get the live spot price at the top of this site on the sidebar. If you’re looking for physical silver, we always suggest you first check your local coin shop and get to know the business owners behind them. Many times you can get a working relationship with them and they’ll be happy to notify you when particular silver products you are looking for come in. There is also something comfortable when doing business face-to-face and paying in cash. Is it in stock and ready to ship? Are they willing to buy back your silver? Do they have phone support? Are there fees for credit card, wires, checks? Are there price tiers for buying in bulk vs. buying 1? What condition will the coins/bars/bullion be in? While mainly for the collector or numismatist, coins shows can also be a good way to buy silver. Many booths will have junk silver, silver bullion, and silver bars apart from all the numismatic coins. While it can be a little intimidating going to your first show, once you get talking to the owners, many are really friendly and quite helpful. 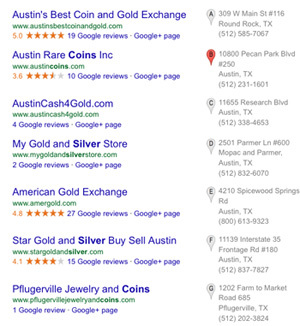 To find coins shows in your city, just go to coin shows and click on your state, most charge a small entrance fee. Very simple. While it is not recommended to buy silver off of these sites, many people do successfully. If you are a first-time buyer you should stay away. But do know there are also some great deals to be had here. 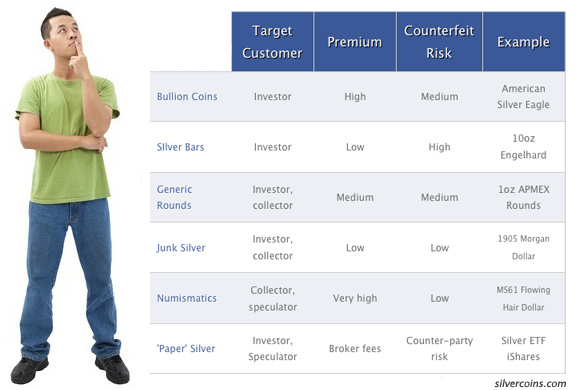 You will want to read my fake silver coins guide on how you can spot counterfeits before you do so. It has a section on ebay and craigslist. You can really find some hidden gems if you’re willing to getup early and drive around town. 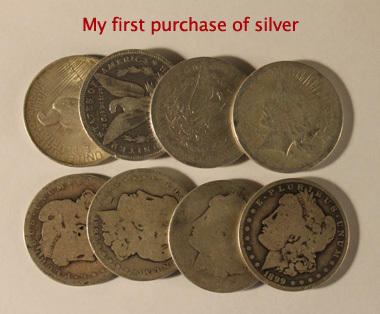 Very few people have up-to-date prices on silver and many will sell their old coin collections or just junk silver passed down from their grandparents. Gsalr.com is an awesome resource to find the next sale, just enter your zip code and start your engines! Mostly for junk silver, since these stores most likely don’t update their prices every day, you can usually find a deal or two if they carry any silver. If silver has had an awesome week, head to your local antique store. Peace and Morgan Dollars may abound! Ever since silver has rallied off its lows back in 2002, coin roll hunting has become more and more popular as a side hobby to find junk silver. 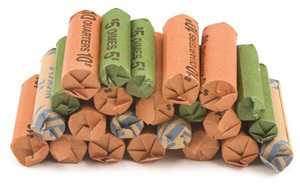 The idea is simple, go to your local bank or credit union and ask for rolled dollars, half-dollars, quarters or dimes (many businesses need loose change). Then search through the rolls for pre-1964 coins and ka-ching you’ve found silver! People will also do this for collectible coins as well hoping to find that rare mint error coin. Be warned this can be very tedious, buying $50 in dimes, and having not 1 silver coin in them can be frustrating. However, when you do find silver, it’s such a great feeling! Whew! That was a long post, hopefully you can take something away from it. Please let us know what you think and comment below, we would love to hear from you! Excellent write up! Very informative. Thanks for sharing this advice on investing in silver! I had no idea that there were so many different ways to invest in silver. In fact, the silver ingots look like a pretty nice way to invest since they are so big. However, I’ll also be sure to check a bunch of different antique stores for any jewelry. I’ve always heard about buying gold and silver as an alternative currency to cash for a few years, but never looked into it. I started looking today on various sites to buy silver, but wasn’t too sure on the difference of junk silver, silver bars etc in terms of value and bartering it in a financial crisis. I’m glad I found this article, it explained all of the questions I had and provided extra info. Well presented without it being unnecessarily boring. Awesome article! I collected coins since 2000ish and stopped back in 2006ish. I haven’t collected until this year when I saw prices going back down. I just want to get a monster box now! Outstanding and very thorough for the beginner..thank you. Thanks for the detailed post. It gave me great insights about buying silver coins. Thank you so much for the detailed post. I had always had a confident to investing in gold coins but not silver coins. It gave me the clear picture about silver coin buying and confidence to invest in it. Thanks again! Keep up your great work. Thanks great information all in one spot and not so drawn out you loose interest. Thanks a lot. I’m off to buy now! Plethora of information here. Thanks for the effort. Great article – very informative. I have purchased bullion on Ebay successfully several times, but I do stick to reputable sellers like Sunshine Mint and MCM. Thank you for the knowledge. Was looking for information regarding buying Silver as an investiment… this was a very informative article. Lots of good information. Great breakdown of all types of silver and methods to buying. Good article-ive been a collector fot over40years off and on. 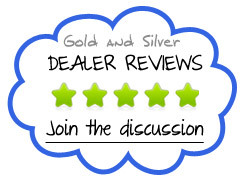 The part about e bay and counterfit coins is true.check feedback ratings. G or me bidding on graded coins is the way i go. But, the coins are by far the cheapest way to invest silver. The boullions are always more expensive. Because the coins are infact “legal tender” so they are considered to be money (hence the “5 dollars” printed on the side). You don’t have to pay VAT on money, if you buy it. Boullions, however, are not legal tender. So they are considered to be objects… and you pay VAT on objects. For the rest, awesome article. This article is a wealth of information for someone like myself, a first time buyer of silver..it is greatly appreciated.